Ontech Systems provides efficient, reliable IT support services to Wauwatosa based businesses as well as the Greater Milwaukee area. Are You Looking for Reliable, Responsive IT Support in Wauwatosa? When your network fails, your business fails. We understand. 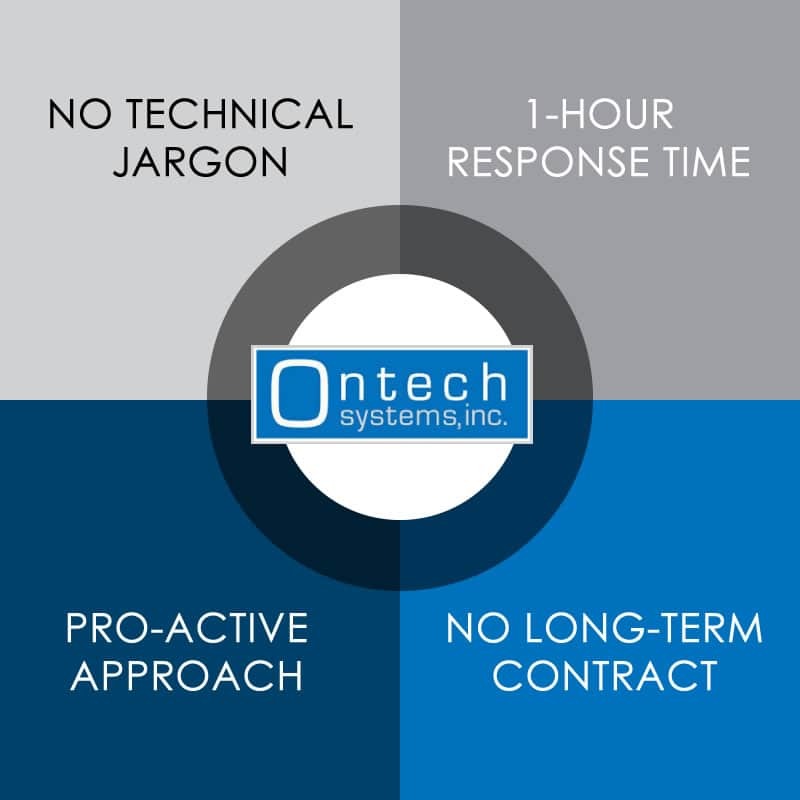 That’s why Ontech Systems responds to client requests by phone or email – within 1 hour of the request during regular business hours. Over the last 10 years, we have achieved a 98% client retention rate—one of the highest retention rates in our industry. Ontech provides IT support and consulting to all of Wauwatosa, Brookfield, Waukesha and the Greater Milwaukee area. From data recovery, to small business VoIP phone systems, virtualization and managed IT services we can provide your Wauwatosa business with comprehensive technical solutions that drive your productivity up and your costs down. What sets Ontech apart from other IT service providers in Wauwatosa? Transparency: To help you clearly understand how we are supporting your IT needs, our techs speak in terms anyone can understand – regardless of technical expertise. You’ll fully understand how we are improving the efficiency and productivity of your business. We’re not a break/fix IT firm: Through our pro-active approach, we integrate your overall business goals and long-term growth potential into our long term IT support plan. No long term contracts: With a 98% client retention rate, our IT service speaks for itself. We have no need to lock clients into long term contracts when we keep our customers happy. Our free, no-obligation Network Discovery is a great first step if you are considering Ontech as your new IT provider. When you request a free, no-obligation Network Discovery, we will schedule a time for one of our techs to visit your Wauwatosa business and evaluate your current network. The tech will offer ideas on how to improve the efficiency and productivity of your business and meet with you afterwards to explain their findings. “How would we handle system failure? Call Ontech Systems or contact us via email today and see for yourself how we can improve the productivity of your employees and reduce the downtime of your current IT network system. To schedule your free, no-obligation network discovery, call (262) 522-8560 or request your free Network Discovery online.